Making sure Deadpool 4k is presented with the best quality, every inch of space on the 4k Blu-ray disc is used for the picture and sound relegated the extra to the Blu-ray disc which also comes in the package. Until earlier this year, Deadpool was just known to the legion of die hard comic book fans around the world. However, In February of 2016 the general public was introduced to the "Merc with a Mouth" and the world has never been the same. In case you haven't heard of Deadpool before, he is nothing like any other superhero you have ever encountered. His morals are extremely flexible, and while he sometimes will help the greater good, he is always in it for himself, as well. He breaks the 4th wall, talking directly to the audience and acknowledges he is a comic book character on the written page, as well as on the screen. Playing the title character is Ryan Reynolds (Green Lantern) who has been in trying to get this film made ever since he was told about him on while on the set of New Line Cinema's Blade Trinity. After a brief and non-rememberable role as Wade Willson/Deadpool in X-Men Origins: Wolverine, test footage was shot for a full blown Deadpool movie, but the executives at 20th Century Fox never greenlit the project. Fast forward a couple of years, and somehow (to this day no one is claiming responsibility) the test footage was leaked online and then the rest, shall we say, is history. After having the online community make a lot of noise about the test footage and the desire to see the film, 20th Century Fox greenlit the production and gave Ryan Reynolds the role he was born to play. With director Tim Miller (Sott Pilgrim vs. the World Scott Pilgrim vs. the World) not wanting to make just an "origin story" film, he and Ryan Reynolds compromised. The film alternates between a revenge story and introducing the world to the situation and circumstances that created the character of Deadpool. The film works by basically letting Reynolds do what he does — run his mouth off with off colored jokes, extreme violence, and a hyperconnectivity that is rarely scene in films these days. Rounding out the cast is Wade's girlfriend, Vanessa (Morena Baccarin; Gotham), his best friend Weasel (T.J. Miller; Transformers: Age of Extinction), The X-Men Colossus and Negasonic Teenage Warhead (played by Stefan Kapicic and Brianna Hildebrand), as well as villains Ajax (Ed Skrein; Transporter Refueled) and Angel Dust (Gina Carano; Fast and Furious 6). All the supporting cast members play their parts perfectly. The only one that could have been handled better would be having Colossus being played by the same person from the other X-Men films, however, rumor has it he was offered the role and turned it down. 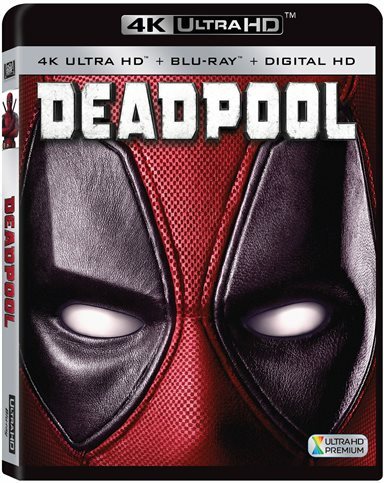 At the same time that Deadpool is making its home entertainment debut on Blu-ray and DVD, 20th Century Fox has also given Deadpool the 4k treatment on the brand new 4k Ultra High Definition Blu-ray format. Benefiting from being filmed in 4k, Deadpool is simply amazing on the new 4k UHD format. While the color palette is a bit muted on purpose, the textures and details on each object in a scene truly make this disc "the demo disc" you will use to show off the new 4k format to your friends and family. Even though the 4k format does not support 3D, it is almost as if the picture jumps off the screen and everything comes alive in the room around you. Rounding out the 4k experience is the Dolby Atmos soundtrack. While this audio format has been around for a little while and used on normal Blu-ray disc, it truly complements the new 4k picture extremely well. Virtual bullets are constantly buzzing past your head, while Ryan Reynolds' hilarious dialog is crisp, sharp, and clear. Making sure Deadpool 4k is presented with the best quality, every inch of space on the 4k Blu-ray disc is used for the picture and sound relegated the extra to the Blu-ray disc which also comes in the package. 20th Century Fox knows their core audience of this film loves to eat and sleep their films and they spared no expense on the extras that are contained on this disc for it's fans. The extras include a normal digital copy of the film that can be redeemed on iTunes or Ultraviolet, a gag reel, deleted and extended scenes, a gallery, Deadpool's Fun Sack ( a look at all the hilarious marketing done for the film), and last, but not least, the big chimichanga of the bunch — an hour and 20 minute long making of featurette entitled From Comics to Screen...to Screen. With the release of Deadpool in theaters, and now home entertainment this year, Marvel and 20th Century Fox bucked the current superhero trend and showed there is an audience for adult themed humor and violence in the comic book genre. Deadpool works well. Amazingly well. So well, in fact, it has become the highest grossing R rated film ever made, and with a sequel already in the works, it looks like we will be seeing the "merc with a mouth" for a long time to come. One can only hope that the same can be said about the new 4k UHD format and the time and quality that the filmmakers and 20th Century Fox used to produce this home theater title. Download Deadpool from the iTunes Store in Digial HD. For more information about Deadpool visit the FlickDirect Movie Database.